$6.9 billion: Total Halloween consumer spending in the United States expected for 2015. 64: Percent of Americans who plan to celebrate Halloween this year. 41.2 million: Potential trick-or-treaters ages 5-14. $74.34: The average amount Americans will spend on candy, costumes, and decorations. $2.1 billion: Projected spending on Halloween candy in the U.S. in 2015. 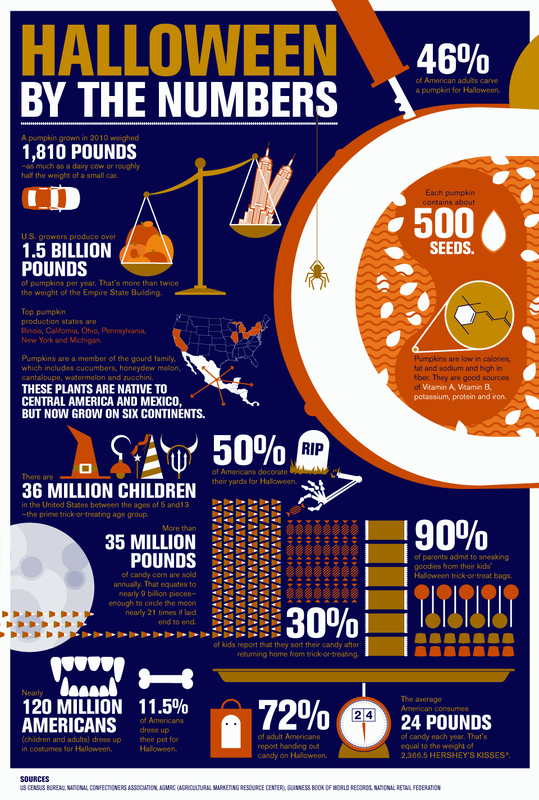 49.5 million: Acres of pumpkins harvested in the U.S. in 2014. 12.9: Percent of owners who plan to dress up their pets this year. For scary cats and dogs, the costume to beat is a pumpkin. 11: Years in a row that a witch has been the number one adult Halloween costume in the U.S.
$255 million: U.S. Box office earnings of horror movies in 2014. More than 1,200: Recognized species of bats, according to Britannica.com. 42.7: Percentage of those surveyed by the National Confectioners Association who said they eat the white part of a piece of candy corn first. Sources: National Retail Foundation, U.S. Census Bureau, IMDB, USDA, The Numbers, and CandyUSA.